I turned six years old in October of 1977. I was old enough to remember seeing Star Wars in the theater, but I have to confess that at the time it didn’t make much of an impression on me. Sure, I had Star Wars sheets and games and assorted gimcrack because other kids I knew had Star Wars stuff and I didn’t want to feel left out. (That’s how capitalism got me.) But I didn’t see a picture that I both loved at the time and continue to love until 1980, when The Empire Strikes Back came out. In 1980, I tasted the power of the dark side, and I liked it. It was the first time I’d ever allowed a movie to matter to me like that, and it was fun. 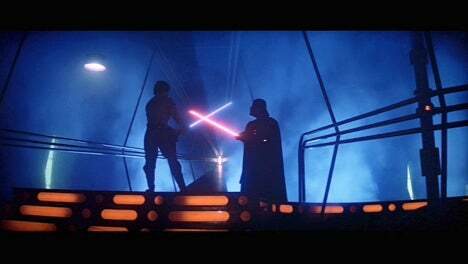 In spite of all my disappointments with the sequel, and with the prequels, and even despite my adult understanding that the original Star Wars is, though energetic, simplistic and laden with clunky dialog, I’ll still screen The Empire Strikes Back with unqualified pleasure.